Welcome to 3Teck Engineering, Manufacturer and Exporter of Vertical and Horizontal Flow Pack Wrapping Machines. The company was incepted in 2012 at Mumbai. Vast industry experience and Good financial position make us different from others. Assured quality products, Experienced RandD department and Market leading prices make us the first choice of our clients. We offer a wide assortment of Packing and Wrapping Machines. Our Packing and Wrapping Machines are best in the industry amongst others. 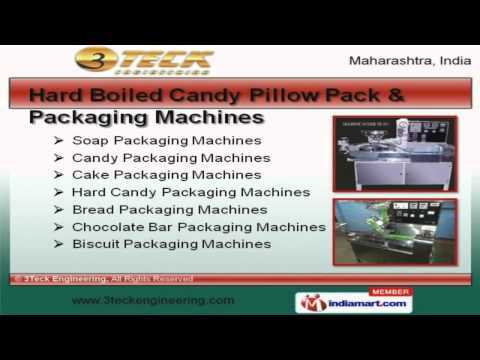 We offer Hard Boiled Candy Pillow Pack and Packaging Machines that are widely appreciated in the market. Packaging Machinery Spare and Temperature Controller for Electric Smoker offered by us are superior in performance. Our Packing Machine for Jelly and Vertical Flow Pack Wrapping Machine for Food Industry are a class apart. We also provide Packaging Machine for Biscuit and Soap that are extremely reliable.